Select an elegant label shape from the gallery, pick the color that suits the design of your store and create your own stickers. Responsive design of such labels will ensure rapid page loads on all devices. Get six packs of ready-made labels which you can use immediately. 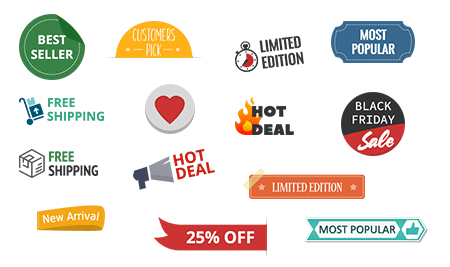 Hot Deal, Black Friday Sale, Limited Edition, Bestseller and other stickers are at your disposal out of the box. Save your time and have fun by emphasizing and refreshing your web product shelf easily. You can also upload any images to your taste and edit them for the distinct purposes of your enterprise. Boost your promo campaigns with the flexible label configuration tools. The extension automatically calculates and displays discount percent or flat amount based on the difference between special and regular price. When discount amounts are decimal numbers, it rounds them using one of three algorithms. 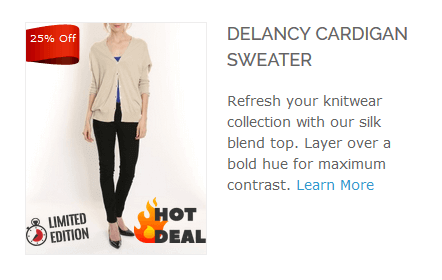 Add Magento image label and text like 'NEW! Arrived 2 days ago!'. The amount of days is indicated based on the variable. You can either use 'New From' and 'New to' dates for a product or set the number of days after product creation when an item should be considered new. Define the dates and particular hours between which the labels should be displayed. So if run a sale from November 23 till December 5 or schedule discounts from 11 a.m. to 4 p.m., the module displays stickers only for these intervals. You can place Magento labels in the following positions: top-left, top-center, top-right, middle-left, middle-center, middle-right, bottom-left, bottom-center, and bottom-right. As well as configure size and styles. Now editing labels doesn't require going to the front end each time you want to view the changes. Label preview instantly demonstrates all the adjustments right in the backend. Easily manage label on the same page - this feature can save you hours of time! Create more than one ribbon for the product. Set priorities if you have large number of stickers. Hide low-priority labels, when the one with higher priority is already applied to a product. Show different labels depending on product attributes. For instance, you can add 'Nike' or 'Apple' logos to all products by these manufacturers or display the "Intel inside" label for all products that have "Intel" as processor attribute. Change status, activate or deactivate and delete labels via mass actions right from the labels grid. For convenience, you can browse labels by product and category pages text. You also can duplicate label quickly if you need similar one with just minor tweaks. The copy will appear on the grid with inactive status. Display the labels only for products within a certain price range. You just need to indicate which price to use for this option, e.g. base price, special price, etc. Turn visitors' attention to products with low stock status. Use stickers like 'Almost gone!' or 'Only 3 left!' and stimulate purchases.Use a condition 'Display if stock is lower than' for the custom Low Stock status. Use any condition combination for displaying labels. For instance, show label for products which meet the following conditions: a) have special price, b) are not new, c) belong to 'Shoes' category, d) are of black color, e) are in stock, f) sku is not Gucci or Armani. Your choice. You can have any number of labels simultaneously. Add multiple labels for each product. For example show '5-year guarantee', '100% recyclable' and 'Save 30%' stickers at the same time for one product. Combine different promo campaigns and season occasions to highlight the products in a proper way. It's possible to display label to particular groups of customers (e.g. General, Wholesale, VIP Member, Private Sales Member). 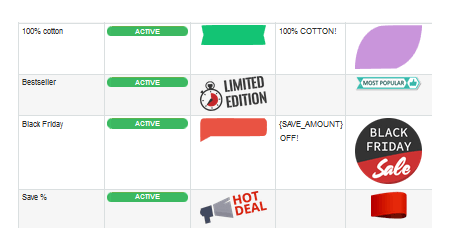 So when you have discounts for wholesale customers, you can show the labels only to them. Feel free to use bigger label images and longer texts on product pages and smaller badges and shorter texts on category and search results pages. You can also create text labels just with a hot text slogan, without images. This feature is designed specifically for configurable and grouped products. Let's say there's a Magneto product ribbon or label for simple product, which is part of configurable. When this option is enabled, the ribbon/label will be displayed both on the simple product and on the configurable product associated with it. When setting up a label, you can choose to products of which category it should be applied. For example if you have a promotion for shirts, than assign label to 'Shirts' category to highlight all items from this category. You can automatically assign labels to sale products in Magento by indicating product attributes, category or other criteria. At the same time you can add labels to individual items, by specifying their SKUs. To see the way Product Labels works please watch the extension video review. To effectively activate impulsive purchases in your store try also the Promo Banners module that dramatically boosts promo effect by incentivizing customers to buy more. It will display numerous banners with special offers and discounts on the most relevant pages like shopping cart page, product and category pages according to customers’ needs. Before starting to inform someone about the discounts you offer, you need to create them. Thus, in order to give customers no chance to leave your store without making a purchase, enhance the Product Labels extension impact with Special Promotions Pro module that enables you to create various types of discounts. Use stock statuses as one more powerful tool of communication with customers. Let them know when exactly this or that product appears in stock and whether some products are running out soon. With the help of Custom Stock Status module it’s easy to motivate people purchase more. Apart from vivid product labels, provide your customers with a smooth browsing via AJAX Scroll, which Product Labels module is fully compatible with. Can I adjust labels position to display them correctly on my site? 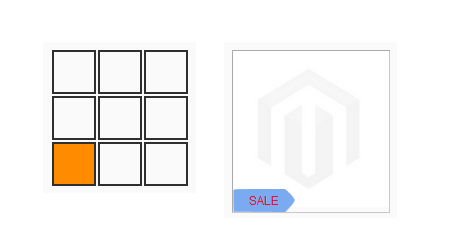 Yes, you can move each magento product label to a fixed position + / - custom offsets. Can I display multiple labels based on product attribute values? Any number of labels can be applied to a product simultaneously: 'on sale', 'save 30%', '100% recyclable'. It's possible to show a label 'new' together with other labels for one image, e.g. to the right side of the product pic. If you want to show labels in different areas, you need to modify the template. What product types are supported by this Product Labels module? A product image label can be applied to any type of products, our extension supports all of them. For a webshop with a very old template some modification was needed in our template files after an update, but Amasty did an excellent job. Good and fast support. Great extension. Easy to use and great support. This is the 5. extension I have from Amasty. And it always work without problem. Thanks guys you are great! Didn't work straight away, but Amasty support fixed it! As the titles says, it did not work as intended on the product-view pages. But the Amasty support team fixed it straight away! Best support by far! Are help me a lot to highlight products at promotion, new products, limited stock products, etc. Amasty team was very helpful and I received support very fast in a small settings problem. This is a brilliant extension although its didn't work with my theme straight away, in fact very few extensions work with my theme but the support team at Amasty got it working fast and efficiently. I've used Amasty for a few extensions and they are always very helpful. HIGHLY RECOMMENDED. That Plugin was pretty easy to install. Great extension & Good support! The extension works great as described. We had an issue with out of stock products but the support staff fixed quickly. Thanks Nikita Drachev and the development department. Great Extension, Even Better Support! The extension itself works great - exactly as I wanted and as described.<br>Normally I wouldn\'t bother to review an extension if this was the end of it but Dzmitry made quite a few modifications to make it work perfectly on my website with no fuss whatsoever, explained what had been changed and created (and emailed to me) backups of every file that had been changed.<br>I\'m massively impressed with this service - highly recommended! The extension itself works great - exactly as I wanted and as described. Normally I wouldn't bother to review an extension if this was the end of it but Dzmitry made quite a few modifications to make it work perfectly on my website with no fuss whatsoever, explained what had been changed and created (and emailed to me) backups of every file that had been changed. I'm massively impressed with this service - highly recommended! Bought this product and had some issues with conflicts with out theme. Got great support and all issues were solved very quickly. Rapid response, I'd buy again with no hesitation. Bought this product and had some issues with conflicts with out theme. Got great support and all issues were solved very quickly. Rapid response, I\'d buy again with no hesitation. Very nice extension! Support was amazing.. I love this extension! Makes my website look a million dollars! Dzmitry was excellent to deal with and went out of his way to make sure I was happy with the extension. He made lots of customisations on my website so they worked on all my blocks. I believe other developers would probably charge you for this! Dzmitry definitely went above and beyond with service! Product now works great and i'll definitely buy more extensions from this company in the future because of my experience with them! The extension work well on my website, Im very glad for that. And the support was very fast and helpfull. We encountered some problems of image not showing on admin and frontend after installing the extension. Amasty support helped us identified the issue is due to file permission. They helped us resolved the issue and added in codes to change permission of image uploaded into our system. Thanks for your great support and swift action. For the extension itself, it is very useful and it fulfills our needs for putting up labels for products. Recommend this if you are willing to pay for it. This extensions works wonders and saves us a lot of time when having to put labels on our products. This plug needed some custom code for our theme, thanks to support its working flawless now. This is not my first Amasty extension, as like the others, support was very fast and the extension is working like a charm. I would especially like to thank to Dzmitry for his support in order to make extension compatible with Ultimo theme and mobile responsive. Extension has excellent features, which works great. But if you have a big shop, don't use this extension. Because it doesn't cache the product labels in the Magento cache. So every pageview it directly checks in the database. This caused to slow our product page down, it had a loading time of 25% in total. Excellent extension. Wokrs as described. Excellent and reactive support. I recommend Amasty products. Quick response from the support team with great solutions. Excellent support from the Amasty team. All problems resolved quickly. This is a great extension! It is a very simple extension to configure and install, the support provided Amasty team is excellent, definitely I recommend this extension for your website. I have bought already a lot of extensions but when I see one from Amasty you just know they work as described without any strange bugs. I buy them without hesitation. My theme (Ultimo Theme) needed a little customisation before the Product Labels showed up, but this was done for me by Amasty Support. Nicely done, backup files and so on. The extension has got almost every needed form of filtering for products on which you want to show a label. We have been using this extension for years and love it. Installed a new Theme and had a few issues. Amasty fixed them very quickly! I've been a customer at Amasty for years; because of their extensions and support for them. I would recommend Amasty Product Labels for everyone who wants to take their webshop to the next level of automication. I use in my store Amasty Product labels extension and works great, it provides and delivers what you expect in an easy way. I always use Amasty extensions for my store, never failed me or had any issue at all. Also the support is the best, you always find a solution in 1 day max. Real great job this guys do! This extension works very well. It was not entirely compatible with our theme, however the support team were excellent with a speedy response time and resolution. Good extension - good service. We have quite a few Amasty extensions and this one is equally high quality, featured, and promptly and excellently supported when it was required (we messed up the installation and Amasty fixed it). Excellent extension. Fast and very good support! I'm very happy with this extension, it works great! A small issue was quickly fixed by the support team. Very useful to show your custom labels on all pages. Great features, and awesome support. Thanks Amasty for the great work. It was not completely compatible with the theme, but support did a great job fixing the issue within almost no time at all and now it looks perfect and really helps customers decide on their buys. Simple but effective extension. Adds a splash of colour to otherwise dull product photos. Great support from Amasty as always. Product Labels by Amasty is a good product to spice up you site with many options! We had a little problem with a zoom module on the product page, but the guys from amasty solved this in no time! Great extension - a must have for any site! Had a bit of an installation issue but, as always, the folks at Amasty quickly responded and solved the problem. We already bought several extension from the guys at Amasty and we will continue doing so. Great extension and excellent service support. Have been using the extension for nearly a year - does exactly what it says. Changed theme on the site this week and needed assistance to re-integrate the extension into the new theme. Dzmitry sorted it for us. This extension is easy to install and works as advertised. I’m also very happy with Amasty support. Very good extension and support. I had a few issues with labels showing up on my custom theme, but all issues were resolved promptly. Bought the extension, works decently by default but had a few issues with our theme. Their developer Dzmitry was awesome in helping us modify it to fit perfectly. Their product and support is why we have purchased 10+ extensions from Amasty. You guys are awesome! ability to select multiple categories. I would like to select multiple categoriien to "e'en label. Now I have to make another label with the same image for each node. There are a lot of 'cowboys' in the Magento business. They all say they have the knowledge , but several times I have been very dissapointed . But NOT with the Amasty extensions. I' m using three extensions now and they all are running perfect. Also this one. I had a slight problem with the installation ( the explanation was to complex for my my experience) But Dzmitry Smolik helped me out with it. My compliments. I recommend Amasty.
. I had a slight problem with the installation ( the explanation was to complex for my my experience) But Dzmitry Smolik helped me out with it. My compliments. I recommend Amasty. Excellent, does what we expected and easy to use and set up! This extension does what it says. We had a little flaw because of our custom site lay-out and Amasty helped us out immediately. Works like a charm now. The products was spot-on what i needed. Even better, as I had a few teething issues, I needed some support; which I got super fast on two different occasions. Very impressive. Thanks very much. We purchased this extension last year and loved it. Then, we converted to a new website, and the extension did not work. It took a few weeks of back and forth between Amasty Support and our developer, but we finally got it resolved. We have a graphic designer who is going to design us some labels that match our website, which will be great. Love that the extension allows for your own artwork. Great Product! Easy to install and custom images in .png included! We've installed the extension on our site www.xenariojoure.nl. The extensions is very good and nice!! Also the service of amasty is very good. Great extension! Eyecatching labels easy to customize and setup for individual and bundles of products with the same attibutes. Easy install and great support. I can only recommend this product and Amasty. I installed the extension a couple of days ago. This was done in just a few minutes and it does what it's supposed to do. Great documentation and awesome support. Amasty replied to my support ticket within minutes as I had troubles customizing. Now everything works as I want it to. Next time when I look for an extension, I'll first check amasty.com if they have a solution for me. Great, easy-to-use and flexible extension! We tried another similar modules that messed up our magento custom theme. The Amasty "Product Labels" were just what we looking for and worked perfectly. The best part was the support, they are fast and very helpful. Recently I had installed this extension but I´ve many additional modifications concerning my special theme and Amasty support worked to fix it, they did it really quick and now works fine. Congratulations. Install was easy and I was quickly able to create some labels. After looking at the frontend I saw an issue with my template. Submitted a support ticket and within just a few hours the solved it for me. Detailed information about the changes they made and left the original files correctly as a backup. So for future updates of my template I know what to do. The extention itself is great. You can create any label you want and there are many way to apply them to your products. Very professional. I am on my 15th Amasty extension and I can't say enough about them and their support. Clean and simple installs and I'm never disappointed with the functionality. Anytime there is an issue they are on top of it quick. As for product labels, I love it. The positioning on catalog versus product pages (or not displaying on one or the other) can be custom and rules are very flexible. Simple but effective tool for communicating valuable marketing messages. If you need this feature I highly recommend this extension. – Advanced integration with Custom Stock Status module and quantity based ranges. 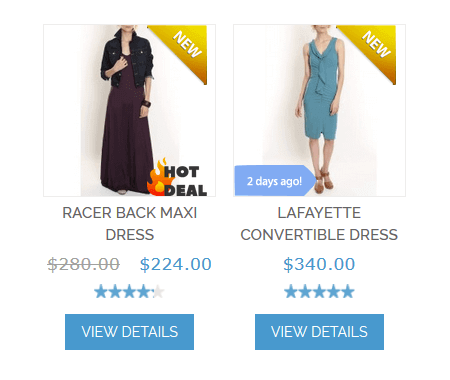 – Option to select rounding algorithm for discounts. 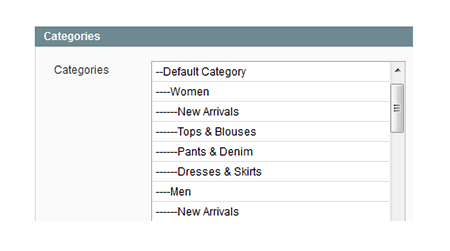 – Option to select customer groups to which a particular label is shown. – Improved compatibility with third-party extensions. – Fix for dates and product duplication. – Fix for price & date ranges. – Auto-detect of product page. – Date ranges for label display. – Product price ranges in conditions. – Better UI for attribute conditions. – Ability to show associated product labels on parent product pages for configurable and grouped products. – Ability to set styles for label text (before was for label only). – Compatibility with Handy Sales Tabs module. – Better admin UI for attributes selection. – SKU field allows more characters now. – Option to set priorities for label display and hide lower-priority labels, when a higher-priority label is applied to a product. – Option to assign labels to individual products when editing products. – Admin mass delete fixed.